The bunkers/air-raid shelters that Italy's dictator Benito Mussolini had built at his Rome residence of Villa Torlonia during WWII. These underground passages have recently been refurbished and can now be visited on guided tours. More background info: After Mussolini assumed full control of Italy as its “Duce”, i.e. 'leader' (ergo dictator!) he obviously had to move to Rome (he was from the north originally). Lucky for him, a wealthy admirer, “let” his family mansion to Mussolini (allegedly for a token of 1 lira a year, i.e. basically for free) so the dictator could use it as his stately residence in the capital. Both the park and the mansion in it are known as Villa Torlonia. The mansion alone is sometimes also referred to as Casino Nobile. Here Mussolini lived with his family (and mistresses) and frequently held court in grand style from the mid-1920s onwards … until he was deposed in 1943. As Europe was descending into WWII, Mussolini became concerned about his and his family's safety in case aerial bombardments should hit Rome or if the Allies even tried to target the dictator specifically. So he had a first underground air-raid shelter prepared. This first “bunker” was actually no more than a “shelter”. It was just a converted wine cellar, covered with earth and leaves so as not to look like anything out of the ordinary. However, it would not have withstood a direct hit. Moreover, oxygen supplies would only have lasted six hours. Furthermore its entrance was located quite a distance from the house – so in the event of a bombing raid you would have had to run it in the open air to reach the shelter. Owing to these shortcomings it is said that Mussolini himself didn't even use this shelter and only sent his family there while staying in the house himself. After only three months the shelter was given up altogether. 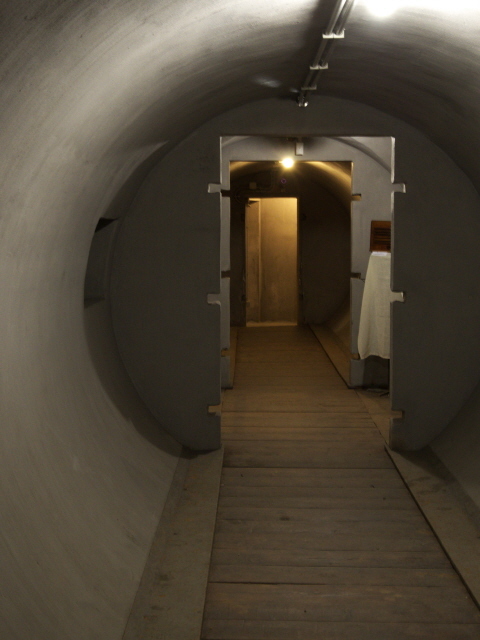 Instead, Mussolini had the cellar of the Casino Nobile mansion converted into an air-raid shelter. That way he and his family could reach it in case of a bombing alarm without having to leave the house. This shelter was indeed used by the Mussolinis right until the dictator's arrest. However, Mussolini was aware that a shelter directly underneath the house that would be such a prime target was not such a good idea either. If the house was hit, the shelter, even if it survived, might be covered in rubble so that it would have been impossible to get out. In the light of that reasoning he commissioned the construction of a proper bunker next to the main house and connected to it by an underground tunnel. Building work was started in late 1942. This purpose-built bunker would have been reinforced enough to withstand even a direct hit, and oxygen supplies/air-filtration systems would have made it possible to stay down there for several days (in theory). But the bunker was never finished. Before it was ready for use, Mussolini had been ousted and arrested. So the bunker construction was halted. Villa Torlonia itself was never actually hit by Allied bombs. In fact, many had believed that Rome would never be targeted by air raids anyway, given that it's the seat of the Catholic Church (see Vatican) and of greater historical and archaeological significance than possibly any other city in the world. And who would bomb such supreme cultural heritage? Had people known, however, what would later happen to such historically valuable places in Germany such as Dresden, they wouldn't have felt quite so secure. They were soon to learn otherwise anyway, as the Allies did indeed bomb Rome, especially in one raid on 19 July 1943, when the San Lorenzo district behind the main train station suffered severe destruction. Ironically, about 40% of the civilians who lost their lives in that raid died inside air-raid shelters, as these had evidently been built to insufficient standards. Apparently there had also been plans to target Mussolini at the Villa Torlonia directly in what was fittingly called “Operation Dux” (“Dux, like “Duce”, means 'leader', i.e. Mussolini – cf. Foro Italico): The raid was originally scheduled for 15 July 1943, but cancelled because of fears of “collateral damage”. At that time, the “Duce” would have been away on a visit to Hitler anyway. However, time was up for the Duce all the same: on 25 July 1943, only a few days after the Allied bombing raid on the city, Mussolini was deposed and arrested. He was never to return to Rome and the Villa Torlonia. After the liberation of Rome in 1944, the mansion became the seat of the Allied High Command until 1947. Later it fell into neglect and the bunkers were all but forgotten. It was only in recent years that the park and the mansion underwent substantial restoration work and were opened to the public. The Casino Nobile now houses a museum/art gallery. The bunkers were only opened to the public as late as October 2014. So my trip to Rome in November of that year was lucky timing in this regard. Indeed, the opening of Mussolini's bunkers/shelters are a massive addition to the overall dark-tourism portfolio of Rome. And there are plans to broaden this further still with the opening of yet more bunkers, e.g. the one under Mussolini's government seat at the Palazzo Venezia. What there is to see: The tour I was on started at the main entrance gate of the Villa Torlonia park and following a brief introduction we were led into the first of the three Mussolini bunkers/shelters at the site (see background). We were admonished that the terminological distinction between 'shelter' and 'bunker' was important and that only one of the three actually deserved the latter designation. So what, the first air-raid shelter already felt pretty much like a bunker, I thought. Stairs lead down a narrow passage which then zig-zags into the heart of the structure. The zig-zagging is obviously a blast-deflecting design. In the middle of this bunker's rooms a few exhibits have been put on display to make the place “come to life” a little. In one niche there's a desk and chair, a clock on the wall and a reading lamp on the desk, underneath it two old newspapers. In another corner several rusty artefacts found in the bunker are displayed, including an oxygen flask, air-filter parts and such like. One airtight steel door is leaning against a wall in yet another corner. Further into the bunker we passed the steel ladder leading up to an escape hatch at ground level, but our group exited through the stairway that we had come in by. In chronological order, the reinforced shelter underneath the Villa Torlonia mansion should have been next, but instead we'd end there as this was connected to the third bunker by an underground passage and by using this we needn't have to go through the museum parts in the mansion above. So we went to the bunker next. This proper bunker is reached through an inconspicuous-looking side entrance in the park a mere 30 yards or so from the mansion. Inside you're in a tunnel-like concrete tube that does indeed look a lot more modern and sturdy. In fact there are four such tubes, arranged like a cross, plus three underground passages leading to two outside exits and one ending directly underneath the mansion. A chart on the wall in one of the tubes illustrates the layout well. The interior of this most modern of the three bunkers is mostly bare, except for two gas masks placed in small square niches in one corridor and a single antique radio set in the main passage. 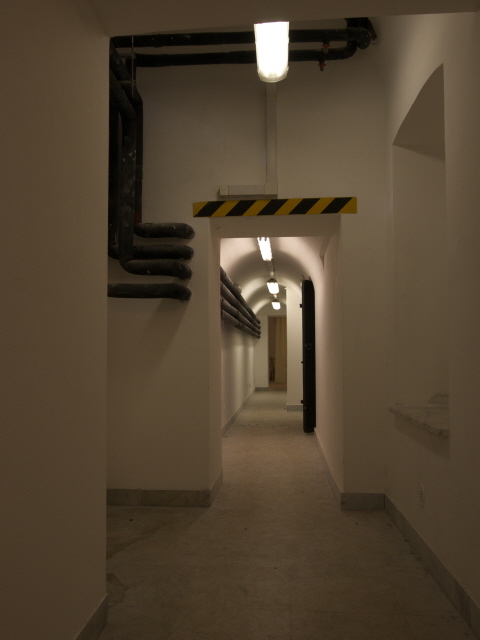 The most museum-like part of the bunker system comes in the air-raid-shelter underneath the Casino Nobile mansion. On display here are several text-and-photo panels in Italian and English. The topics covered include Mussolini's life in the Villa Torlonia, the abandoned Allied plans of bombing it (“Operation Dux”), photos of the damage caused by the San Lorenzo air raid of 19 July 1943, and the system of air-raid sirens installed in Rome from the mid-1930s onwards. A map of Rome shows the locations of several surviving such air-raid sirens that can still can be found. Apparently this system of sirens remained in operation until 1975. Until then they were test-sounded every day at noon! Another map and photo panel shows the locations of other bunkers within the Rome area, including those underneath the Palazzo Venezia and at the EUR (see under Rome and Foro Italico). The air-filtration and anti-gas system is explained on yet another panel. One air ventilation pipe is still in place on the ceiling. The guide claimed that the system used the same technology as that in the gas chambers of the death camps of the Holocaust, only in reverse, i.e. sucking air/gas out instead of pumping it in. I found this latter story a little hard to believe. Maybe it was based on the frequently encountered but mistaken belief that the Nazis used shower heads on the ceilings to pump gas into the chambers. 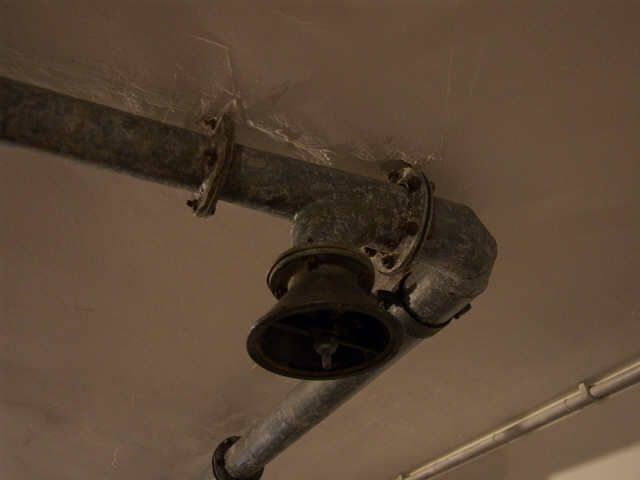 But in actual fact these shower heads were usually just fake mock-ups, just to give the appearance of a shower room. The gas, however, was usually either pumped in through vents at floor level (if it was exhaust fume carbon monoxide) or released from columns which had hatches at the top through which the Nazis poured Zyklon B pellets which dissolved on contact with air. 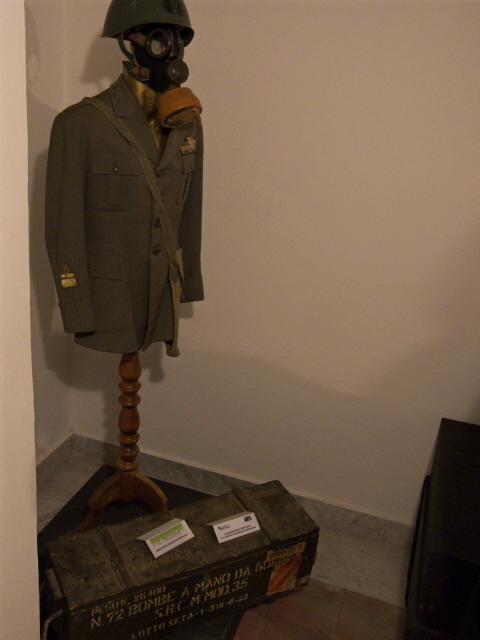 I found the genuinely spookiest bit in the bunker was the set of displays in one corner that consisted of a dummy on a coat stand who was wearing a gas mask, helmet and uniform jacket. The light fixtures made this dummy project ghostly shadows on the walls behind it. At the bottom of the stand was a big ammunition box that once contained hand grenades. A creepy image in a very different sense was a large blow-up of a photo showing Mussolini in a white jacket standing stony-faced amidst a crowd of about a hundred men in uniforms posing on the steps of the Villa Torlonia Mansion. Most of these are grinning and many cheering, hands in the air ... only the “Duce” maintains his well-rehearsed sinister pose and expression. 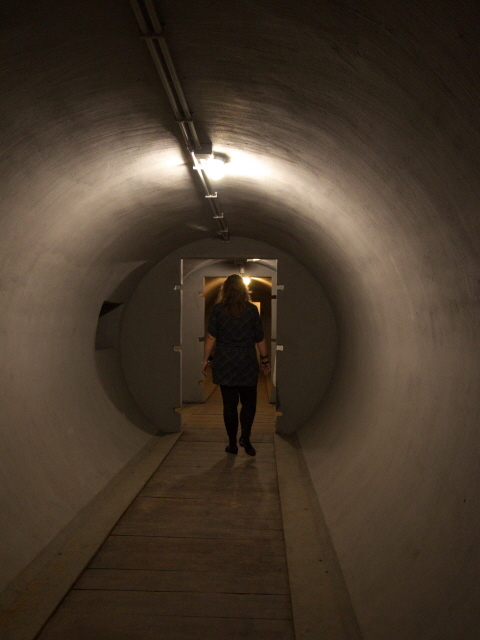 We then retraced our steps through the underground passage and the bunker and went back outside. The tour ended with the guide pointing out some above-ground structures, mainly air-vents, that could give away the existence of a bunker underneath to the trained eye, but which to most people who stroll around the park would look totally inconspicuous. Indeed I spotted a little girl in a pink jacket happily and innocently running round and round a concrete structure that was one of the escape-hatch exits of the bunker. It was quite a juxtaposition! All in all, I found this a most valuable addition to Rome's dark-tourism attractions. The bunkers aren't all that big and look almost a little too refurbished (no musty smells, all walls freshly painted), but it was still a certain thrill to be able to get to see them, especially given their historical connections. The tour narration by the guide as well as the exhibits certainly provided added value and an educational element on top. Location: The Villa Torlonia park with its eponymous mansion and the bunkers/shelters are located a bit out of the very centre of Rome to the north-east about a mile and a half (2.3 km) from the central station (Termini). Access and costs: restricted, by pre-arranged guided tour only; group tours are quite affordable, private ones very expensive. Details: Getting to Villa Torlonia is relatively easy by public transport. Buses stop very near the entrance to the park on Via Nomentana, I found line 62 especially useful for connections to the Centro Storico. Just a couple of blocks south of the park, tram lines 3 and 19 also provide useful connections. Line 3 can take you straight to the Colosseum, and line 19 terminates at the Vatican – these are long rides, though. The metro stations Policlinico and Bologna (line B) are also within walking distance, in this case to the rear entrances to the park. Prices: regular scheduled tours (but you still need to sign up in advance!) cost only 7 EUR per person, which is very good value for money! When I planned my trip to Rome no scheduled tour seemed to be available within my time window so I initially agreed to have a private tour arranged for just my wife and myself – and I was asked 50 EUR for this. That would have been quite expensive, of course. Luckily, however, enough further participants signed up to join us once the tour was arranged and advertised online, so that in the end we were a group of about a dozen and were all just charged the regular 7 EUR per person fee. Time required: The guided tour lasts approximately 90 minutes. Combinations with other dark destinations: nothing in the immediate vicinity – but see under Rome in general and Capuchin Crypt in particular. 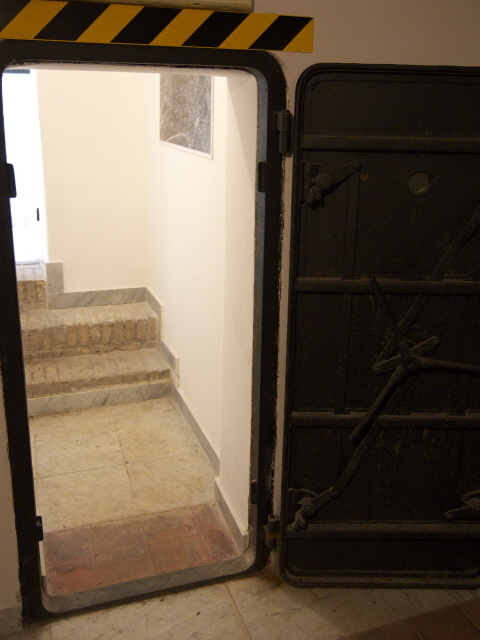 Sotterranei Di Roma (who organize the tours of the Villa Torlonia bunkers) are apparently also trying to make the bunker underneath Mussolini's government seat at Palazzo Venezia accessible to the public as well. But at the time of my visit this was still only a general plan and when it might actually happen was unclear at the time of writing. Combinations with non-dark destinations: The park that the Villa Torlonia and the bunkers are set in (and which is also called Villa Torlonia) is pretty and unusual in that it is in the English landscaped style, complete with mock ruins and a theatre. The Villa Torlonia mansion is also accessible and serves as a museum, or rather: an art gallery. Here the fact that the palace was used by Mussolini is not a topic at all. From Villa Torlonia it is not far to the picturesque “fantasy” architectural ensemble of the Coppedè quarter – see under Rome.